PORT-OF-SPAIN: In the Caribbean, we struggle, like other people around the globe, for increased media autonomy and international participation on our own terms. A long, long, long time ago, before I was a published author, when my childhood love of books was being nourished in Trinidad on the imported imaginings of Dr. Seuss rhyme and Enid Blyton’s Famous Five, I knew that I would one day publish children’s books that reflect life in the Caribbean. With the advent of the internet, and increasing market acceptance of print-on-demand, that dream is now an accessible reality. As a consequence, this year I decided to launch an independent imprint, Meaningful Books. Meaningful Books leverages the opportunity that print-on-demand offers to take risks in our still grossly under published market. Using picture books as care-giving tools intended to open doors to more meaningful conversations between children and their guardians, the imprint is partnered in Trinidad with a Non-Governmental Organization, Creative Parenting for the New Era. The inaugural title is Pink Carnival!, about a child known only as Small Man (the precocious street name given to young boys here), who goes on a walkabout around the Queen’s Park Savannah on his Dad’s shoulders. Inspired by the natural beauty of the pink pouii (also called “rain tree”) blossoms, Small Man asks to purchase a pink hat at a vendor’s stall. Dad says, “No, Pink is for girls!” Or is it? Pointing to every manner of pink Small Man can I-Spy during the carnival street parade, his Dad is soon convinced that pink is for everything and anyone, even Mummy’s hair!—as she joins them in her carnival regalia. Prior to launching Meaningful Books I spent many months researching publishing options locally and online before I settled on the POD services of Xlibris Corporation, in large part because of their affiliation with the name Random House, which I knew and trusted all my reading life. I requested a sample picture book and print version of their promotional brochures, which they promised would reflect the quality of their publications. I was delighted with what I received. And, as it turned out, the picture book of elephants they sent was photo illustrated, just as my inaugural title Pink Carnival! would be. Then Xlibris offered a two-for-one deal that I could not refuse. I jumped! 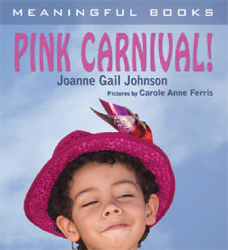 In September 2008 I submitted the final picture and text manuscript files for Pink Carnival! In November I received, as anticipated, beautifully printed hard and soft cover samples of the full color picture book. 1. The credits were not placed how and where I had stipulated. 2. The page numbers were no longer centered in the corner of the pages as they had been in the files I submitted. 3. I wanted the text on the last page changed from pink to white. This was the only correction that reflected a change of mind on my part. I went on to receive official purchase orders from the National Association of Libraries and Information Services of Trinidad and Tobago for 50 copies; another for 10 copies from an indigenous gifts outlet; and a commitment from a chain of local retail bookstores to carry the book on consignment, including the option of a dedicated shelf space with promotional signage. However, to date of this writing, November 2, I cannot capitalize on this demand for my book: On receipt of my second set of author review copies, I quickly discovered that not only were my original items of complaint uncorrected, but other, more obvious defects were added. This began a painful process of six (and counting) review copies issued to me: one with a blank white page inserted between pages 14 and 15; another with Dad’s face in a garish (not at all skin-like) red tone, cropped borders with Dad’s shoes falling off the page, Small Man’s neck now visible where his chin should be cropped, soft cover laminates mottled so as to inflict a skin disease on the child pictured, and a clear gray sky that, until now, I had never before seen. Meanwhile, two of the three original items I requested were not corrected until round four! Needless to say, my original confidence in Xlibris dissolved. If Xlibris cannot get out a single author’s review copy, produced to standard professional quality, how will they provide consistent quality for an order of 100 copies? If and when we ever get to that stage, I will now have to check each and every one to ensure its “sellable” quality to my booksellers and readers. And what of the copies that will be issued, unchecked by me, via their online store? Other legitimate questions have arisen as well: Why is it that when I require any changes I must pay a US$50 base fee each time just to get started, but when Xlibris creates errors there is no real compensation? And why do I now feel like I am working unpaid for Xlibris, helping them with quality control? I had asked for and received a full-color children’s picture book sample which was, indeed, beautiful. But I was never told to expect some “acceptable variation”—an excuse that cropped up somewhere between round four and six of my author’s review copies. Would it be so hard for Xlibris to advertise honestly; to provide consumers with a list of its picture book limitations, so as to more accurately reflect the Xlibris reality? With this information in the early stages of conception, authors could then design their books to suit Xlibris’ limitations. Even so, Xlibris acknowledged each time that the problems in my situation were unacceptable by their standards, as well as mine. Ultimately I was offered compensation for my troubles: five free books per each 100 ordered or free shipping on my first order of under 250 copies. (Although they may not in fact be sellable and may mar a hard earned professional reputation). Xlibris says they will guarantee and replace any unacceptable volumes at their own cost. No one at Xlibris has responded to my request that a guarantee on services and books be published on their web site and extended to their customers, both authors and book buyers alike. I will admit, however, I have received the most polite, “have a nice day” treatment from what sounds like truly sincere individuals. Without exception the Xlibris staff have so far responded to my complaints with an efficient corporate script, but have done little to either ease my concerns or remedy the situation. It is as though the system has lulled everyone into forgetting about the business of printing books. Any manager worth his or her salt would never have allowed book after book after book to be shipped with these printing errors, all proudly displaying the Xlibris logo. The negligence was such that my six year old easily spotted the errors on his own, giving rise to yet another valid question: What do you call “banana republic” standards when they originate in corporations based in the First World? In Trinidad, a small island country with a relatively high literacy rate, but with a market still very young in exploring its pleasure for culturally relevant books, I enjoy the support and patronage of Moms and market leaders. But for now, this island author is waiting in good faith knowing Carnival will come again next year and the pink pouiis may bloom around Port-of-Spain, but still wondering if and when Xlibris will deliver? Joanne Gail Johnson has published numerous books for children, including Ibis Stew? Oh, No! and the forthcoming The Donkey and the Racehorse. She is acquisitions editor for the Island Fiction series published by Macmillan Caribbean and has served since 2006 as the founding Regional Advisor for the Society of Children’s Book Writers and Illustrators-Caribbean South. EMAIL: Joanne Gail Johnson directly. VIEW: Her website and blog for Macmillan Caribbean’s Island Fiction series.